At the start of this year I decided to sign up for a few swaps to get my creative juices going. The end dates were nicely spread out between April and June, so I figured 3 was the perfect number to handle. 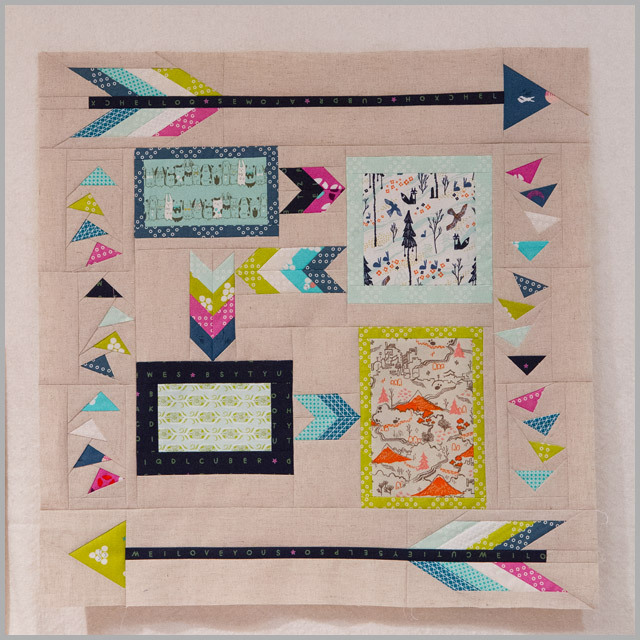 Having completed the Rainbow IG Mini Quilt Swap and the UK Mini Quilt Swap, my final task was the Cotton + Steel Mini Quilt Swap. This was the one I was most cautious about, I have to admit. With all the other swaps I’ve done, I’ve been free to use whatever fabric I wanted, but with this one I was totally at the mercy of what particular Cotton + Steel lines my partner liked. Combining the options she had given me line-wise with the colours she preferred (no primary colours, and a non-white background), Tokyo Train Ride seemed the best option for the main prints, and I chose a couple of bundles from the Fabric Fox, who were generously offering a discount for swappers, one of which combined some of the Tokyo Train Ride prints with some of the basics. Throw in a little Mochi and I was all set to create. Having pieced it, I then had to work out how to quilt it, which was when I really started to sweat, why on earth do I make such ridiculously complex piecing that doesn’t lend itself to nice, uniform quilting?! Anywho, I sucked it up and quilted in the ditch round the outside and inside of the framed sections, added a platform for the wee dudes to stand on, an FMQ path through both forest and mountains, and some serpentine stitching for the river. I then added train tracks next to the chevrons, and quilted straight lines in the ditch round the geese and out to the edge of the section behind them. The arrows got some flight lines from behind the head of the arrow, and then I did the head in the ditch too. All the quilting was done in a neutral to match the Essex Linen background, so it’s not obvious unless you’re up close and personal with it. And here it is done. I forgot to take a photo of the finished package, but I was in a bit of a rush to get it in the post due to some unexpected changes in plan! It's fab – well done!! 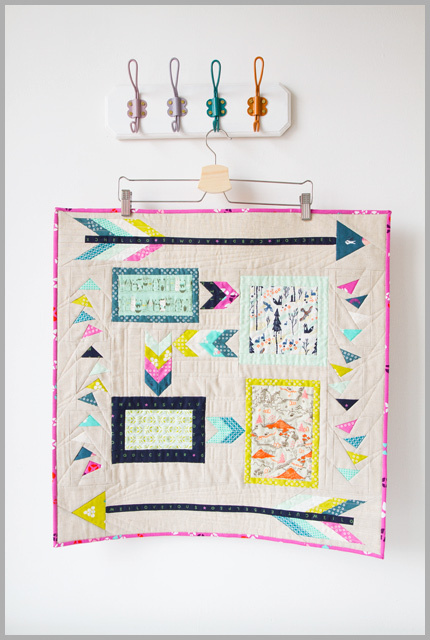 I love this Katy, the colours, the design, your lovely piecing…it all sings. Well done!! Very cool! Success in my book! I would have been deliriously happy to receive this mini. Fabulous design for the C&S mini Katy! seriously dont know how you gave this one up! I love your mini! Your partner is very lucky.